Get off the yo-yo dieting and night-time eating with Counsellor and Therapist, Anne Goodman. Reach and maintain your weight and health goals. Reach and maintain your weight goals with no more negative self-talk. How many times have you lost and gained weight? Do you eat when you’re bored or lonely? Have you dealt with your emotions yet? Night time eating, snacking between meals, sugar, chips, pastries, cakes and cookies. What causes you to fail at your diet? Enjoy your life and the process of achieving and maintaining your goal. No deprivation, or will power required. No more negative self talk about your body. Releasing that extra, stubborn weight once and for all. Really feeling good about yourself. 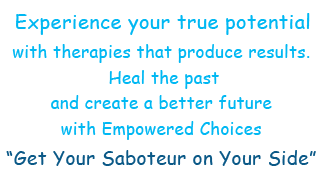 GET YOUR SABOTEUR ON YOUR SIDE! Goal Setting – Create a compelling goal and learn to stay focussed on it. Visualising Your Goal – skills to help you keep your positive outcome top of mind throughout the day and night. What you focus on increases! Hypnosis to support your goal – Trance sessions to support you in your chosen lifestyle. Learn EFT – EFT is a tool you can use on your own to eliminate stress, negative self talk, and negative emotions. Learn to address Secondary Gain and Resistance – when you get in your own way, what to do. EFT for Overlay Emotions – emotions about how you feel about yourself that you have this issue. ND, testing for allergies, sensitivities, adrenal and thyroid function – I can refer you to a number of different ND’s, or you can go to someone you already know. It’s nice if I can communicate with the ND if necessary. Regular Stress Reduction techniques you can use daily – Cortisol is the stress hormone. Overloads of cortisol cause us to hold on to body fat, especially around the middle. Stress reduction is key to staying focussed on your goal and reaching it! Support for your individual food plan – your food plan is up to you. I can make suggestions and I will support you with whatever plan you choose. I’m not a dietician or nutritionist. Your exercise Plan - Again, this is up to you. I am happy to make suggestions. Walking is great! Using EFT to ‘Follow the Trail’ – how to find ‘core issues’ and clear them. Resources to support you in reaching your goals are available here.